Users with unrestricted access permissions to files and folders are the ultimate target for cyber-criminals. If such accounts are compromised, then the attacker effectively holds the keys to your kingdom. Continuous tracking of who has access to what on the File server is a vital part of ensuring that your permissions don’t sprawl out of control. In this article, we will go through the manual ways in which changes made to files and folders can be identified. 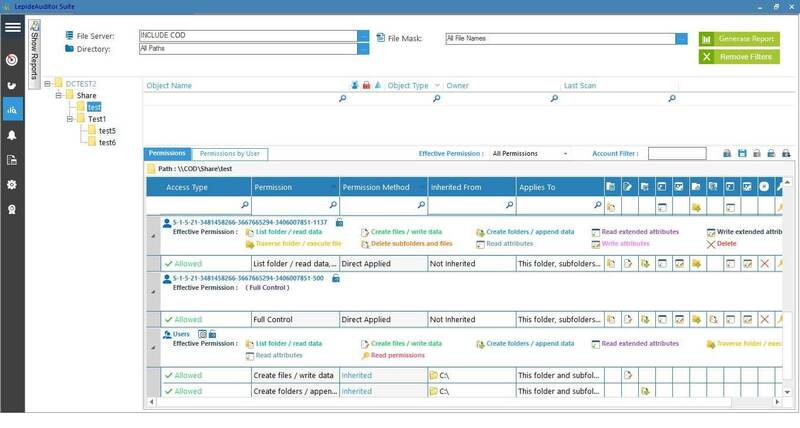 We will also show you how LepideAuditor handles this task. Keeping sensitive data under close surveillance helps keep your network infrastructure in a constant state of security. To do this, event-by-event analysis is crucial. Locate the document for which you want to view the permissions. Right-click the folder or file and click “Properties” in the context menu. Switch to “Security” tab and click “Advanced”. In the “Permissions” tab, you can see the permissions held by users over a particular file or folder. Click “Select a user” to add the user or group whose effective permissions you want to view. 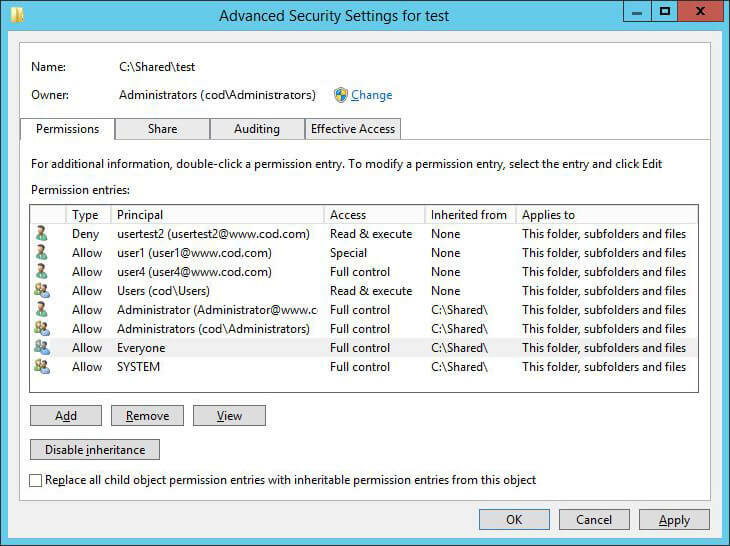 A list of all the effective permissions held by the user will be displayed on the bottom panel of the “Advanced Security Settings” window. 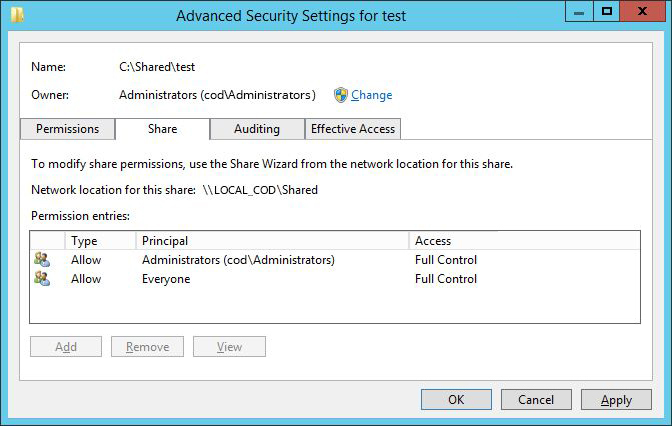 To view the share permissions set on a shared file or folder, switch to “Share” tab. You can see a list of permission entries. 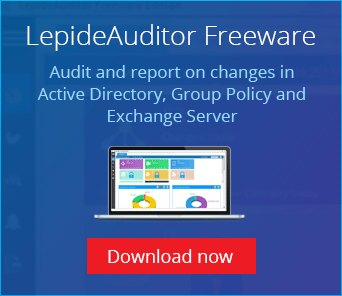 With a comprehensive auditing solution like LepideAuditor in place, you can easily analyze current effective permissions held by users on files and folders, as well as modifications made to permissions. Our solution allows you to view permissions assigned to everyone, filter and sort the reports, identify stale objects and also indicates if the permission inheritance is broken at that level. 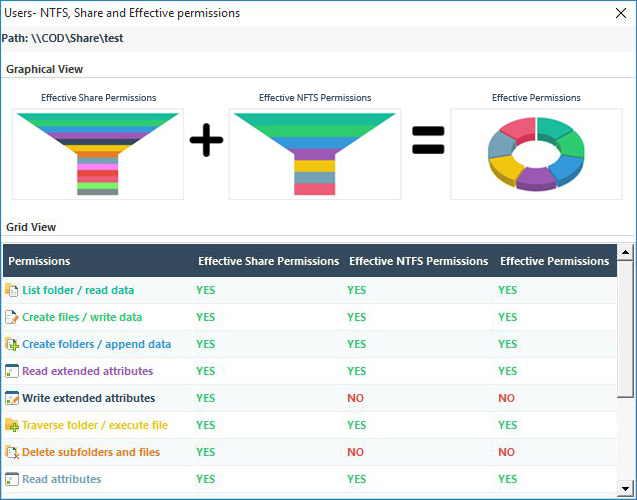 All the 13 default permissions are represented using different colors and icons in our reports. 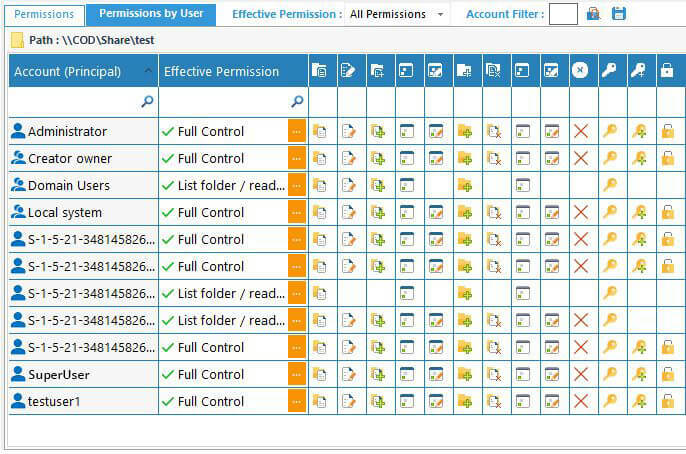 The following screenshot displays the effective permissions held by the members of a Group. In addition to the reports shown here, LepideAuditor for File Server generates reports for inherited permissions, direct permissions and indirect permissions. You can also keep track of all changes in the permissions of files and folders.